It's rude and the person behind you almost certainly wants you dead. We all have very little personal space on a plane, and reclining just takes valuable breathing room from the person behind you. And don't use the old "I'm sleeping" excuse. The seat reclines two inches. Is two inches really the only thing between you and a nap? It's called common courtesy. I can't speak for anyone else but when someone reclines in front of me I'm imagining every possible way to annoy them for the rest of the flight. It's a touchy subject for sure. One of the biggest problems is that the person reclining and the person behind see the issue from completely different perspectives. The recliner is gaining something and the person behind them is losing something. It's difficult to find common ground in there. Travelers have suggested that maybe it's a mistake to pit the passengers against each other in an already charged environment. Flying is no longer the exciting part of a journey it once was. 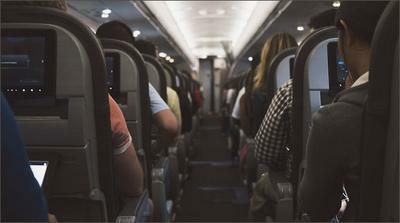 Diminishing seat size and leg room, charges for checked luggage making competition at the overhead bins rather intense and rigorous security measures have often taken their toll on passengers by the time the seat reclining issue rears it's head. It's not hard to understand that a person might feel that they'd given up enough. Should airline seats recline at all? Maybe that should be the question.